Objectives: Apexification is a challenging treatment in necrotic open apices teeth and bacterial leakage is the main reason for the treatment failure. The aim of this study is to compare the effect of mixing mineral trioxide aggregate (MTA) with chlorhexidine (CHX) on microbial leakage in apexification treatment of simulated immature teeth. 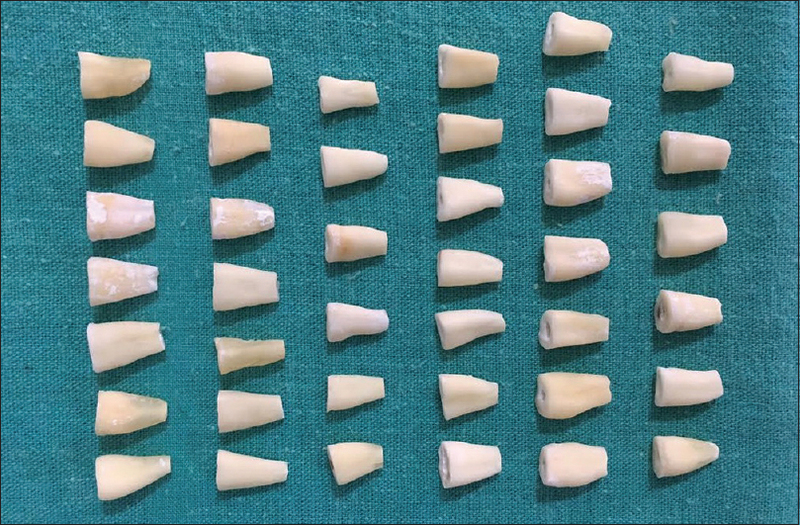 Materials and Methods: In this experimental study, 44 intact central incisors were selected based on inclusion criteria. The coronal and 2 mm of apical part of the specimens were removed till all root segments were 12 mm long. The apical parts of the teeth were prepared using Profile #40/0.06 (Dentsply Maillefer, Ballaigues, Switzerland) in the apical to coronal direction to simulate open apices. The specimens were separated into experimental groups (n = 40) and control groups (n = 4). Group 1 delivered a 5 mm apical plug by MTA/H2O and group 2 delivered an apical plug by MTA/CHX 0.12%. The positive control group had no apical barrier; on the other hand, the negative control group had an apical barrier and two layers of nail varnish on entire root surface. The microbial leakage assessment was done by a dual-chamber apparatus using fresh human saliva after 10-week follow-up. The turbidity of the lower chamber containing the Brain Heart Infusion (BHI) solution was analyzed based on the McFarland (0.5) standard which utilizes spectrophotometry results. Data analyses were done using Chi-square, Kaplan–Meier, and log-rank tests. 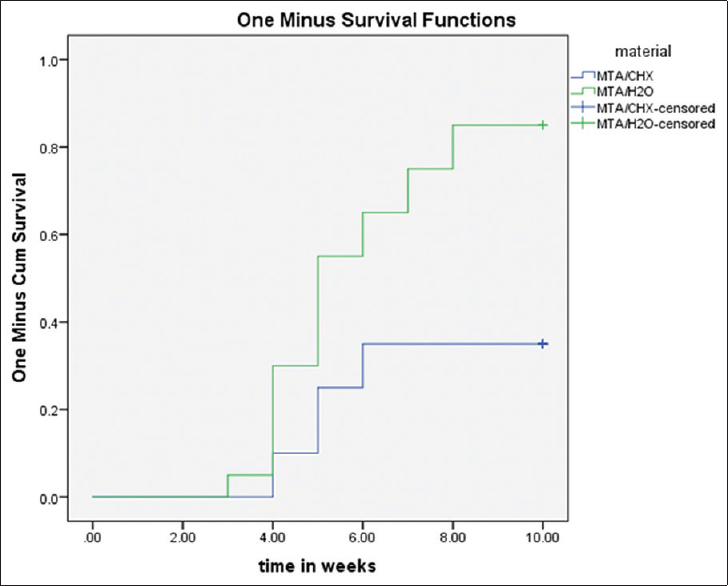 Results: MTA/CHX group had lower microbial leakage percentage (P = 0.001) and longer time of leakage (P = 0.002) in compared with MTA/H2O group and the difference was statistically meaningful. Conclusion: Based on the results of this study, MTA/CHX mixture can reduce the amount of bacterial leakage. Microbial leakage is one of the main reasons of endodontic failure, especially in immature necrotic teeth that have undergone apexification treatment., The most important factors contributing to apical microbial leakage are the obturation technique used, physical and chemical properties of filling material, presence/absence of smear layer, and coronal sealing ability of the restoration., The microbial leakage preventive property of apical plug material is an important factor in the treatment of necrotic immature teeth. Mineral trioxide aggregate (MTA) is the material of choice in these treatment modalities. MTA consists of fine hydrophilic particles, which transform into colloidal form in the presence of moisture. The material has good biocompatibility and sealing ability properties. Apexification treatment using MTA apical plug leads to more appropriate and predictable results compared to the more traditional Ca(OH)2 apexification technique. There is a variety of leakage tests including dye leakage, fluid filtration, radioisotopes, electrochemical, glucose and amino acid filtration, and microbial leakage test available. Microbial leakage tests may be performed using single species, multiple species, saliva, direct detection of bacteria ion through scanning electron microscope, or detection of leaked bacteria using polymerase chain reaction. Microbial leakage assessment using fresh saliva has advantages over single species or multiple species analysis because of its mixed microbial component and presence of enzymes that makes the technique unique and closer mimics a clinical situation. The aim of this study is to evaluate the effect of CHX mixed with MTA on bacterial leakage of apical plug in simulated immature teeth using human fresh saliva. The present study protocol was reviewed and approved by the Research Ethics Committee of Islamic Azad University, Dental Branch, Tehran, Iran (code: IR.IAU. Dental. Rec. 1396,20). In this experimental study, 44 human central incisors were sampled based on inclusion criteria. Central incisors were confirmed radiographically to have just one root canal without calcifications, resorptions, cracks, or dilacerations. During root canal preparation and apical plug fabrication, any harm to root causes crack formation, fractures, or unqualified plug formation leads to specimen exclusion from the study. The teeth were kept in 0.9% saline solution at 37°C before microbial leakage testing. The crowns and 2 mm apical part of the roots were removed with a diamond disk in a low-speed handpiece at a level, which 12 mm of the root were remained [Figure 1]. Scaling of the root surfaces was done to remove any calculus or stains and 5% hypochlorite was used for 15 min to remove superficial tissue tags. Root canal preparation of the specimens was done using ProTaper rotary files (Dentsply Maillefer, Ballaigues, Switzerland) and 2.5% hypochlorite was used for irrigation. Apical parts of each specimen were prepared using Profile #40/0.06 (Dentsply Maillefer, Ballaigues, Switzerland) in the apical to coronal direction to simulate open apices. All the apical part of the specimens prepared using Profile #40/0.06 in depth of 10 mm to create apical diameter of 1 mm. The smear layer was removed using 5.25% hypochlorite and 17% EDTA, each for 1 min, respectively, and finally, the canals were rinsed by distilled water. Negative control group: It includes 2 specimens with 5 mm of MTA (Angelus, Londrina, PR, Brazil) apical plug of which the entire root surface including apical surface covered by 2 layers of nail polish. Periapical radiographs of all specimens were taken to confirm the quality and quantity of the 5 mm plug and unsatisfactory specimens were excluded and replaced. The accepted specimens were kept in an incubator (Shimaz Co, Tehran, Iran) for 1 week at 37°C and 100% moisture to complete the setting process. A dual-chamber technique using fresh human saliva was used for microbial leakage measurements. Each specimen was fixed in polyethylene tubes, of which 3 mm of the root tip was left out of the tube. The gap between the root and tube was sealed by paraffin wax. The initial complexes were put in a sealed package then sterilized by ethylene oxide gas for 12 h. Then, under a microbial hood, the initial complex was fixed on sterilized glass tubes to form a dual-chamber complex [Figure 2]. The upper chambers were filled by 3 ml mixture of saliva and BHI solution in 3:1 ratio and replaced with fresh solutions every 3 days. The lower chambers were filled by BHI solution. The dual chambers were kept in incubator at 37°C and 100% moisture till follow-up times. The saliva was collected in a sterile container from a caries-free person with normal PH range (determined by Tornosol paper) who had not brushed at least for 12 h, and salivary secretion was stimulated using a paraffin tablet. The lower chamber solution was detected for any turbidity weekly, using a spectrophotometer (KHB L-3180, China) based on 0.5 McFarland standard (1.5 × 108). The experiment was continued for 70 days. The data were analyzed using SPSS software (SPSS version 19.0, SPSS, Chicago, IL, USA) and Chi-square and log rank tests were done. To assess the survival ranks, the Kaplan–Meier test was performed. The significant level was set at 0.05. Forty-four specimens underwent microbial leakage test using fresh human saliva. In the MTA/H2O group, 17 of 20 (85%) specimens had leakage, while this phenomenon was observed in only 7 of 20 (35%) of MTA/CHX specimens, and the difference was determined statistically significant (P = 0.001) [Figure 3]. None of the two negative control specimens had leakage during the 70 days of follow-up time, while the positive control specimens had leakage just in the first follow-up session [Table 1]. The mean leakage time for MTA/H2O group was 6 weeks and the lower and upper bound values (95% confidence interval) were 5.06 and 6.94, respectively, while the mean leakage time for MTA/CHX group was 8.25 weeks and the lower and upper bound (95% confidence interval) was 7.19 and 9.31, respectively. It should be mentioned that the leakage time between the experimental groups was significantly different (P = 0.002) [Table 2]. The survival ranks were demonstrated in [Figure 4]. One of the most important concerns in treating necrotic teeth with immature apices is constructing an appropriate apical barrier with a predictable sealing ability. This study showed that mixing MTA with CHX 0.12% instead of distilled water increased the sealing ability of fabricated apical plug against salivary microbiota. In an in vitro study by Mittag et al., increasing the antimicrobial properties was observed when MTA was mixed with CHX in a dose-dependent manner, whereas MTA/H2O had a little antibacterial effect. Previously, Stowe et al. and Holt et al. had similar results using Enterococcus faecalis. The potential significance of these findings may explain the lower microbial leakage rate in MTA/CHX group compared to MTA/H2O in our study. Timpawat et al. have shown that antibacterial properties of root canal filling material can reduce microbial leakage. Adl et al. demonstrated that CHX has no adverse effect on setting process of MTA and the push out bond strength of MTA/H2O was not significantly different from MTA/CHX. In an in vitro study, Bidar et al. concluded that the marginal adaptability of MTA had not been adversely affected by mixing MTA with CHX, whereas there was a meaningful difference in compressive strengths of MTA/CHX 0.12% compared to MTA/H2O and MTA CHX 0.2%. In an in vivo study, Sumer et al. showed MTA/CHX 0.12% was a biocompatible material and was tolerated well by surrounding connective tissue. Mixing MTA with CHX gel can adversely affect setting time of the material, but this drawback had not observed when MTA was mixed with CHX solution. In this study, the microbial leakage test performed in a similar fashion as performed by Oliveira et al. and Aminsobhani et al. using fresh human saliva. In a microleakage study by Arruda et al. involving silver nitrate solution, they had demonstrated mixing MTA with distilled water or CHX had not adversely affected the sealing ability of the material. The same results were obtained by Shetty et al. and Shahi et al. in dye leakage studies. Based on the result of this ex vivo study, mixing MTA with CHX improves the sealing ability of the resulting apical plug in open apices teeth, but this effect is not important clinically if an appropriate coronal seal provided with well-sealed coronal restoration. Ayatollahi F, Tabrizizadeh M, Hazeri Baqdad Abad M, Ayatollahi R, Zarebidoki F. Comparison of microleakage of MTA and CEM cement apical plugs in three different media. Iran Endod J 2016;11:198-201. Shahi S, Bashirzadeh A, Yavari HR, Jafari F, Salem Milani A, Ghasemi N, et al. Effect of different mixing methods on the bacterial microleakage of white Portland cement and white mineral trioxide aggregate. J Dent Res Dent Clin Dent Prospects 2017;11:84-9. Likhitkar MS, Kulkarni SV, Burande A, Solanke V, Kumar CS, Kamble B. To evaluate the influence of smear layer with different instruments and obturation methods on microleakage of root canal filled teeth:In vitro study. J Int Soc Prev Community Dent 2016;6:240-4. McHugh LE, Politi I, Al-Fodeh RS, Fleming GJ. Implications of resin-based composite (RBC) restoration on cuspal deflection and microleakage score in molar teeth: Placement protocol and restorative material. Dent Mater 2017. pii: S0109-564130409-8. Mirhadi H, Moazzami F, Rangani Jahromi S, Safarzade S. The effects of alkaline PH on microleakage of mineral trioxide aggregate and calcium enriched mixture apical plugs. J Dent (Shiraz) 2016;17:16-20. Lin JC, Lu JX, Zeng Q, Zhao W, Li WQ, Ling JQ. Comparison of mineral trioxide aggregate and calcium hydroxide for apexification of immature permanent teeth: A systematic review and meta-analysis. J Formos Med Assoc 2016;115:523-30. Escobar-García DM, Aguirre-López E, Méndez-González V, Pozos-Guillén A. Cytotoxicity and initial biocompatibility of endodontic biomaterials (MTA and Biodentine™) used as root-end filling materials. Biomed Res Int 2016;2016:7926961. Willershausen B, Hagedorn B, Tekyatan H, Briseño Marroquín B. Effect of calcium hydroxide and chlorhexidine based gutta-percha points on gingival fibroblasts and epithelial tumor cells. Eur J Med Res 2004;9:345-50.
da Costa LF, Amaral CD, Barbirato DD, Leão AT, Fogacci MF. Chlorhexidine mouthwash as an adjunct to mechanical therapy in chronic periodontitis: A meta-analysis. J Am Dent Assoc 2017;148:308-18. Gupta N, Singh N, Thapar B. Effect of addition of 2% chlorhexidine gluconate, calcium hydroxide, and tetracycline powder on antimicrobial activity of mineral trioxide aggregate. Endodontology 2016;28:23. Nikhil V, Jha P, Suri NK. Effect of methods of evaluation on sealing ability of mineral trioxide aggregate apical plug. J Conserv Dent 2016;19:231-4. Karagenç B, Gençoglu N, Ersoy M, Cansever G, Külekçi G. A comparison of four different microleakage tests for assessment of leakage of root canal fillings. Oral Surg Oral Med Oral Pathol Oral Radiol Endod 2006;102:110-3. Savadkouhi ST, Bakhtiar H, Ardestani SE.In vitro and ex vivo microbial leakage assessment in endodontics: A literature review. J Int Soc Prev Community Dent 2016;6:509-516. Mehrvarzfar P, Akhavan H, Ghasemi S, Khodaei F, Tour Savadkouhi S, Dianat O. Mineral trioxide aggregate mixed with normal saline, calcium chloride or ky jelly as apical plug in simulated open apices: An in vitro microleakage study. Iran Endod J 2014;9:45-9. Mittag SG, Eissner C, Zabel L, Wrbas KT, Kielbassa AM. The influence of chlorhexidine on the antibacterial effects of MTA. Quintessence Int 2012;43:901-6. Stowe TJ, Sedgley CM, Stowe B, Fenno JC. The effects of chlorhexidine gluconate (0.12%) on the antimicrobial properties of tooth-colored ProRoot mineral trioxide aggregate. J Endod 2004;30:429-31. Timpawat S, Amornchat C, Trisuwan WR. Bacterial coronal leakage after obturation with three root canal sealers. J Endod 2001;27:36-9. Adl A, Shojaee NS, Sobhnamayan F, Shojaee NS. The effect of chlorhexidine on push-out bond strength of mineral trioxide aggregate. Avicenna J Dent Res 2014;6(1). Bidar M, Eslami N, Naghavi N, Fasihi Z, Attaran Mashhadi N. The effect of different concentrations of chlorhexidine gluconate on the compressive strength of mineral trioxide aggregate. J Dent Res Dent Clin Dent Prospects 2015;9:1-5. Sumer M, Muglali M, Bodrumlu E, Guvenc T. Reactions of connective tissue to amalgam, intermediate restorative material, mineral trioxide aggregate, and mineral trioxide aggregate mixed with chlorhexidine. J Endod 2006;32:1094-6. Kogan P, He J, Glickman GN, Watanabe I. The effects of various additives on setting properties of MTA. J Endod 2006;32:569-72. Oliveira SG, Gomes DJ, Costa MH, Sousa ER, Lund RG. Coronal microleakage of endodontically treated teeth with intracanal post exposed to fresh human saliva. J Appl Oral Sci 2013;21:403-8. Aminsobhani M, Ghorbanzadeh A, Bolhari B, Shokouhinejad N, Ghabraei S, Assadian H, et al. Coronal microleakage in root canals obturated with lateral compaction, warm vertical compaction and guttaflow system. Iran Endod J 2010;5:83-7. Arruda RA, Cunha RS, Miguita KB, Silveira CF, De Martin AS, Pinheiro SL, et al. Sealing ability of mineral trioxide aggregate (MTA) combined with distilled water, chlorhexidine, and doxycycline. J Oral Sci 2012;54:233-9. Shetty KH, Prathap MS, Prithviraj KJ. Sealing ability of white and gray mineral trioxide aggregate mixed with distilled water and 0.12% chlorhexidine gluconate as a root end filling material: An ex vivo evaluation. Indian J Dent Res 2013;24:395. Shahi S, Rahimi S, Yavari HR, Shakouie S, Nezafati S, Abdolrahimi M. Sealing ability of white and gray mineral trioxide aggregate mixed with distilled water and 0.12% chlorhexidine gluconate when used as root-end filling materials. J Endod 2007;33:1429-32. Veríssimo DM, do Vale MS. Methodologies for assessment of apical and coronal leakage of endodontic filling materials: A critical review. J Oral Sci 2006;48:93-8. Zehnder M, Belibasakis GN. On the dynamics of root canal infections-what we understand and what we don't. Virulence 2015;6:216-22. Siqueira JF Jr., Ricucci D, Roças IN. Bacterial biofilms and endodontic disease: Histobacteriological and molecular exploration. The Root Canal Biofilm. Springer Berlin Heidelberg 2015:103-25.